Ruthiebear (Titusville, NJ, United States) on 18 June 2013 in Animal & Insect. 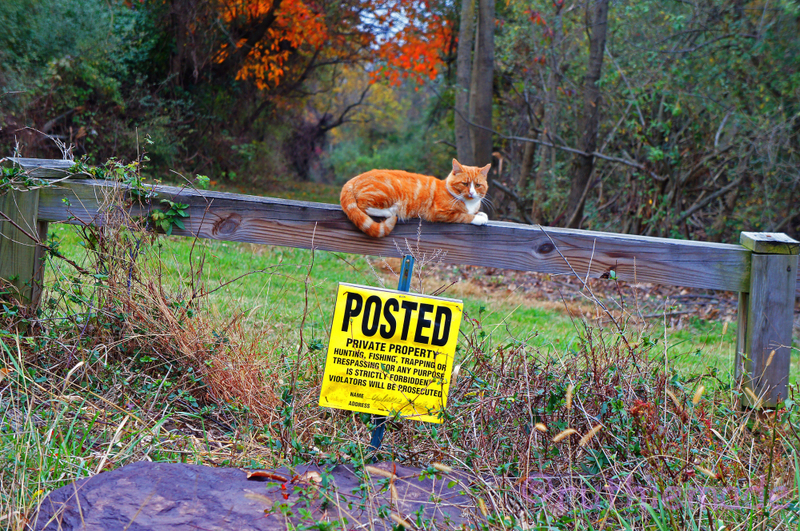 Happy ST. Is this a guard cat or a violator of the sign? From the expression it could be either. Do not mess with the cat. hilarious - either way it is very funny! Well spotted and Happy ST Ruthie! Can this guy to read. Otherwise you may accidentally do something unlawful. Well spotted... and I'm thinking he may not have posted the sign, but if you trespass you'll have to answer to him! lugar y donde se ha subido es su lugar favorito. Linda imagen, con hermosos colores..***** Buen día. Wooooooooo... magnifique matou, drôle et au bon endroit. Avec l'inscription, c'est bien drôle! Mais il y a aussi l'autre cadrage qui ne prend en considération que le chat et les tonalités oranges de l'arbre. Ha ha - the cat does not know fishing is forbidden. Clever find!! Happy ST. The cat should not sleep under leaves, they discolor !! Just right the sign ,he is the guard ...!! Super colours in this shot, looks like a guarding cat to me! Très bien vu!!! j'adore++++ ta photo!! Ce chat roux sur la barrière, la pancarte et la touche de couleur en fond comme le chat génial. The cat seems to try to hunting or fishing ! Happy ST ! Beautiful cat, but not really do not know to go over or not!:-))Haleja. Happy ST day to you ,my friend! :))) Une belle image, insolite ... Bravo Ruthie ! Bon après-midi. Bises. Wow what a vibrant color for a cat, I have never seen this shade before!! Beautiful!! "The guardian of the temple" excellent composition and a great photo for ST. I like a lot. Have a good day. Happy Silly Tuesday. chat dangereux... bien vue Ruth. A fine shot to catch this cat apparently keeping watch on the posted property. Excellent. Wonderful shot with plenty of character ! I like how the sign and the Cat pull the viewer right into the scene ! Rich landscape colors and the wood beam all make for a perfect frame !! Very cute ! A clever framing and shot. I think this is an "autumn" cat - the same colour as the leaves behind. so so beautiful frame, colors & lights!!! Excellent framing ! Nice work ! Very funny! Cat's always look so authoritative as if the fence could be its property line. Crikey! What a real marmalade cat! Haha, I love the cat sitting on top of that, lovely for ST Ruthiebear!! Just in case trespassers miss the sign, they surely won't miss the colorful cat who seems to say, "Go no further!" Happy ST! From his expression, he looks like a guard cat! Wonderful color! Happy ST! Guard cat.... Nice color and detail. I love the way the orange in the fur blends with the orange in the leaves. He is so perfectly posed for this shot. Great eye! I would vote for guard cat. Cute shot! That is one orange cat! Definitely, a guard.